I sit on the graham cracker colored benches of the medurah (firepit) gazing at the turquoise ocean radiating through the tall trees. I feel the rough, sandpaper-textured stone scratch my legs. I notice the glowing, ghost-like faces of freshly sunscreened campers, and the scorching sun setting slowly beneath a cloud kingdom. As we get into Shiru l’Adonai (psalm), campers and tzevet (staff) alike hop out of their seats like eager bunnies. Campers put their arms around me, and I feel the spirit of Shabbat electrifying and coursing through our veins, overflowing our hearts, re-charging, rejuvenating, energizing our souls. This is Kabbalat Shabbat at Ramah Galim, or Ramah of the Waves. As my seven life changing weeks at Ramah Galim came to a close lastkayitz (summer) of 2017, I was about to embark on the biggest journey of my life: my gap year. I was to travel to twelve countries independently before college. 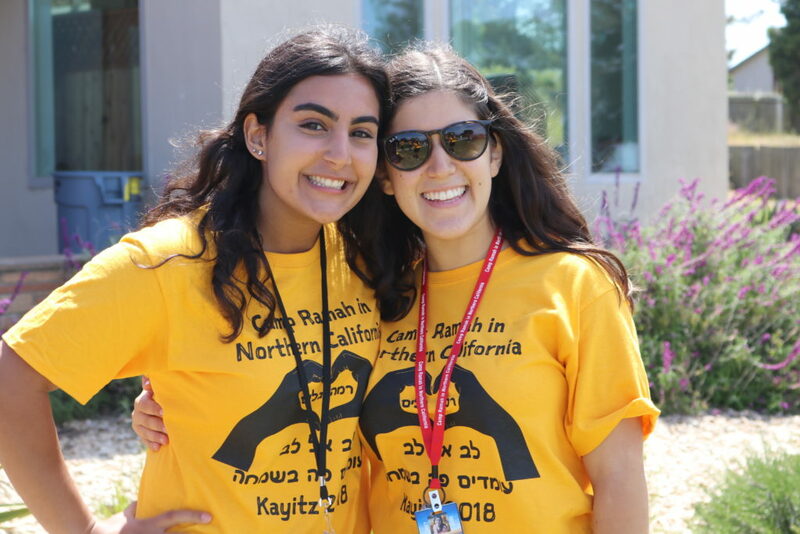 At camp, I constantly took pride in learning new things and using my Jewish voice in new ways, and I knew that my Judaism was going to be one of the only constants while I was abroad. My diet, lodging, friends, and mood would change day by day, but I had the power to choose Judaism to ground me through all of the commotion and variability. I was wildly excited but also terrified, and planned to use what I had learned at camp to strengthen my Jewish identity while I was abroad. A few weeks after camp ended last summer, I headed to the Holy Land of Israel. Not a bad place to start off my travels. I lived with modern orthodox cousins, spending each Shabbat devouring new books, going on never-ending walks through the neighborhoods of Ra’anana, and learning how to cook mouth watering, Middle Eastern dishes for Shabbat lunches. However, when the High Holidays rolled around, I went to shul(synagogue) for the first time. I didn’t know the tunes, and I felt like an outsider even in the Jewish state of all places. Where were my camp tunes? Where was my sense of belonging? I finally found this feeling of belonging when I went to visit one of my best friends, Emunah, in the Upper Galilee. She comes from a significantly more religious background than I do, so I was nervous about joining her for Shabbat. But when her father took out the benchers to say the Birkat HaMazon (prayer after the meal), her family joined together in the Birkat tune I knew from camp. My face lit up, and I sang my heart out with my best friend and her family who I had just met. From Israel, I went to Spain, and again, I felt a loss of connection. I went to an Orthodox synagogue for Shabbat, and sat alone in the back, struggling to feel anything but nervous and campsick. Next up was Cuba, which contained a hidden treasure within its borders. My grandfather had raved to me about the new synagogue in Havana, built with help from the Joint Distribution Committee, where he works. I knew I had to check it out, so on Friday evening, I schlepped my not-Jewish friend, Francesca, on a 45 minute walk to the synagogue, whilst in our nice Shabbat clothes and shoes. It was definitely not the most comfortable of walks, but when we entered the grand synagogue and saw the large number of Cuban Jews who were there for services, I was beyond thrilled. Our service was led by two boys who could not have been much older than me. They knew ALL of the words and were so passionate as they chanted the Kabbalat Shabbat (Friday night) service. I looked at them, awestruck, in the same way I do when Eric leadsshacharit (morning prayer) or Rabbi Sarah gives a fantastic Shabbatdrash (summary of the Torah portion) at Ramah. I was completely amazed, because on the one hand, I was the most disconnected I had ever been in my life. I was incredibly far from home, in every sense; in a completely different world and society, with no ability to contact anyone with no working phone or Wi-Fi. However, amidst this immense isolation, sitting in the Havana synagogue on Kabbalat Shabbat, I felt SO connected to myself, to G-d, and to Judaism. I felt a similar connection at my next destination, Nicaragua. My grandmother lives there, so I have grown up there and have been more times than I can count. My whole life, my parents said that we were going to go to the Chabad (type of Orthodox synagogue) on our next trip. And after years of running out of time each trip, we finally went when I was about 17 years old. We introduced ourselves to the Rabbi and his family, and he gave us a tour of the synagogue and his falafel hut. I remember that day dreaming of moving to Nicaragua, babysitting his kids, and working in the falafel hut. Flash forward two years or so, when I was back in Nicaragua on my own for my gap year. I put on my Shabbat clothes and walked to Chabad for services and dinner. The minute I walked in, the Rabbi andRebbetzin (Rabbi’s wife) remembered me from my visit a few years back. We caught up, I met their new baby, and had the most delightful service and meal. The Rebbetzin even said that I looked exactly like her grandmother who had passed away, and that it was b’shert (fate) that I came in to see them again. From Nicaragua, I continued on to Mexico, Peru, Italy, Germany, Holland, Sweden, Norway, and Denmark. In Berlin, Germany, I visited the Memorial to the Murdered Jews of Europe. In Venice, Italy, I walked through what used to be the old Jewish quarter. In Copenhagen, Denmark, my grandma and I visited the teeny, tiny Jewish museum. In Madrid, Spain, I stumbled across a Jewish museum completely randomly, on my way to a food market where I met an old, Israeli couple who I had a drink with. In Scandinavia, my grandma and I befriended two Jewish couples from the East Coast who I am planning to visit when I am in college in Boston. At a fjord in Norway, I heard a group speaking Hebrew, and ended up finding my Israeli cousin’s neighbor. These powerful moments were separate, unique, and very different, but when looked at as a whole, allowed me to remain extremely Jewishly connected while I was abroad. And I owe so much of that to camp. Though I had so many incredible Jewish moments while traveling, I kept dreaming of the day that I could be back at the shores of my home away from home, Ramah Galim. So, after 9 months of traveling, I returned home to San Francisco, slept for a few days, packed again, and a week later, drove down the coast to 783 San Andreas Road, where I was greeted by friends, new and old, by the most delicious strawberries in the world, by the glittering ocean, and yes, even by the crisp Watsonville fog. It was my first Shabbat back at camp. I sat, remembering when just a year ago, I sat on the graham cracker colored benches of the medurahpreparing for my big adventure. And here I was again, on the graham cracker colored benches of the medurah, wondering where all of the time had gone. And after everything I had seen, heard, tasted, felt, and experienced, I chose camp. I chose teaching a kid how to play Heart and Soul on piano, making friendship bracelets with my kvutzah (bunk), and playing knockout with the Solelimers (7th and 8th grade campers) duringchuggim (electives). I chose waking up to a day, a community, and a me full of meaning and intention. I chose sun butter and Shabbat brownies and meals loaded with dairy and carbs. I chose boogie-ing in the water and boogie-ing on land during rikkud (dance) and Havdallah dance parties. I chose hugs from my campers (side hugs, of course… no full frontal! ), the comfort of my onesie, and arm-in-arm walks and talks down to the beach on Havdallah (the end of Shabbat). I chose “ozi v’zimrat ya” (a Havdallah song) and the sounds of Edan’s majestic voice, seeing everyone’s faces in the candle light – a look of melancholy as we bid Shabbat adieu but immense excitement as we looked forward to the new week. I chose Kabbalat Shabbat, gal gal shel Torah (hafochba hafochba!) and tfilot (prayer services) each morning, even if we were in the freezing and wet chorshah (Solelim’s prayer space). I chose masaot (overnight trips), the nikayon (clean up) song at each meal, and of course, theHimnon Ramah Galim (Ramah Galim song). I chose pshhh-ing at any and every moment, and even my springy, uncomfortable camp bed that I passed out in the late hours of the night when I returned from tzevetprogramming. Though I am heartbroken that I was unable to stay at camp for the entire summer, I can confidently say that coming to camp a week after my gap year ended was the best decision I could have made. Sure, I was exhausted and overwhelmed, but there was nowhere else I wanted to be at the end of my year before I headed off to college. So, kayitz, summer, kayitz 2018 (CLAP) that’s a wrap! Full of ups, downs, and everything in between. New friends, new experiences, and new hopes for next year. Learning how to trust people, to challenge myself, and to appreciate the value in honesty, vulnerability, authenticity. And though as I sit here writing this piece I do miss camp with all of my heart, camp for many of us is over for the summer. It is part of our past, and that’s where it will stay, until next summer, when we are back on the shores of Ramah Galim, with sea breeze in our hair, sunblock caking our faces, and each of our best selves shining for the world to see. You can read more about Sofia’s journey on her blog, Fia on the Fly.